A Q & A with Jim Rickards, New York Times bestselling author of The New Case for Gold, The Death of Money, Currency Wars and The Road to Ruin, from an interview with Alison Vekshin of CNN International. Jim Rickards climbing Mt. Denali in Alaska in June 2018. Like you do. Here’s my question to Jim re: the CNN International interview posted Aug. 27th in the blog 3 Min. Gold News – GOLD AND RUSSIA. Link to the CNN interview Vidcast. If Russia and China created a Putin coin and Xi coin denominated in SDRs and backed by gold, would the value of the coin be influenced by the rise and fall in value of the US dollar, because such a large percent of the value of the SDR basket itself is the US dollar? If you peg gold to the SDR, changes in the value of the dollar would affect both the dollar value of gold and the SDR value of gold for the reason you mention. For example, if the dollar is going down against the euro, the dollar value of gold would change more than the SDR value of gold because the euro is also an SDR component and the euro rise offsets the dollar decline to some extent (not 100%, but partly). Also, the strength or weakness of the dollar does correlate to the dollar price of gold somewhat, but not 100%. Sometimes the correlation is even positive, although it is usually negative. This is what physicists refer to as a “three body problem” which is exponentially more difficult to solve than a two-body problem and almost impossible in many cases without massive computing power. So, you make a good point, but I would refrain from categorical answers because there aren’t any. The bigger issue is that there may come a time when no one particularly cares about the dollar value of gold because the SDR has emerged as the global numeraire. That’s a big deal. Gold is at $1,210.40 U.S. per ounce. The literate person, who grew up with the phonetic alphabet, lives in a world that is rational, and in a space that is continuous, straight lined, and uniform. They build their thoughts and lives one-step-at-a-time in a sequence. The printing press didn’t just teach us how to read; it taught us how to think. Some other languages are symbolic and pictorial in nature – meaning is communicated instantly and is many layers deep. The current global monetary system and communication system are built on the phonetic alphabet world view. Since the discovery of electricity and all the technological changes since, the globe is changing and is about to make a stunning leap forward. The phonetic language of the Renaissance with its mechanical printing press has used the eyes, with the visual look of a series of symbols that don’t relate to their sounds, to draw meaning when you reach the end of the sequence and sentence. We think and communicate in a mechanical series where ancient societies were aural and the sound came from everywhere at once and understanding came with insight – an alchemical change. The electric age, with its instant on-and-off didn’t just bring new ways to relay an idea, it brought a change to the mental processing of the idea itself. To the way we envision possibilities – not just how we think but also what we think we can think. The digital age is a loss to the person born into an analog world. And the digital world is a new culture, and the new brings a painful change, as all change has pain. We shrink away from the new onslaught as we as a human race evolve new ways to interpret and communicate our ideas. We want to feel connected to other humans. We want to be valued. And this crossover time is painful as we can feel alone inside a whole communal infrastructure. The communal infrastructure becomes more and more available to everyone from the poorest to the most wealthy and it becomes harder and harder to feel that we and what we ‘have’ is enough. The paradox of the pauper inside the trillion dollar infrastructure. The constant comparisons are difficult to adjust to as we need to develop our ability to sift through and choose what to ‘look’ at. The tribal societies could choose what sounds to concentrate on as all sound came at them at once. We must learn to curate the input all the massive amount of stimuli comes at us in an onslaught. As we develop the ability to curate our own world we can find our own joy and our own control. We can learn to trust our own judgement and not rely on someone else to interpret or curate for us. We can do this. Mass media tells us its too much and we must trust them. But we can each trust ourselves. We can filter and turn off what does not serve us well. Without a filter there is too much coming at us at once. The communal infrastructure brings a race for individuals with wealth to monetize the masses through the public paths. The swing from the visual ruled world to the aural ruled world of instant arrival doesn’t change in a continual even tempo to its conclusion. It is slow and then fast. Like insight. Like a flash of understanding after sitting in a bath of information. Soaking it in. And then, “Eukeka!”. It is alchemical in that it seems to mingle and stir together in a pot, and then suddenly change into an entirely new thing. The change can be painful unless we are prepared. But we can’t prepare for a new thing we have never experience. And so, we look to the past for clues as to what is coming on the road ahead. How do we communicate in an environment that is changing? How do those with power adapt to the change? The symbolic thinker, the creative minded and the artist minded, see the new possibilities and connect dots that were not previously seen as a metaphor or simile. These people are ahead of the curve and always seen as odd. They feel odd. (Let me tell you.) They’re not welcomed at first but they see what’s coming faster that the masses or the usual resident inside an environment. Dis-economies of scale show that the larger a system is the slower it adapts. It takes longer for it to change, just as it takes a while to turn a big ship around or for a train to come to a full stop. This has affected the way we as humans think. Just as the printing press and phonetic alphabet changed our thinking from a tribal aural environment to a visual individual experience, the coming of electricity brought us back to a communal all-at-once era. New ways of quick communication were to happen after this. And so electricity brought the telegraph, the radio, the television and the internet. We could see a whole field in our path all at once and not a mechanical unfolding over time in a sequence. This has affected old media like newspapers. Where there used to be long articles to sit and absorb there are now ‘fields’, or smaller frames of the beginning of an article, with lots of bits of information all over the ‘screen’. Lots of visuals that symbolically mean something. Our televisions now have the same frames with running banners across the bottom and branding logos in the corners. Websites can be a mass of fields all moving at once. All coming at us while we try to sift through. The different ways of information and idea movement changed in a sequence that depended on how large it was. The largest systems change the slowest. They seem to have stayed the same as the new media blossoms around us, and then suddenly they change in what feels to the outsider like all at once. It’s the biggest and therefore the slowest changing. But when it finally does change that switch will be fast. When we are confronted with an overwhelming new environment we shrink back to the core of who we were as a culture. As an individual. A family. Friends. Nations. We go back as far as we need to in order to feel solid ground that we understand. Once we feel solid we can then move ahead into the new world. Marshall McLuhan called this the ‘rear view mirror’. He said we are traveling down a highway while looking in the rear view mirror. We feel nostalgia for a time just before this age, to what felt understandable. We wear jeans, not because we’re farmers and need the durable fabric to work the fields, but because they’re a symbol of the comfortable and solid farming days. when our parents, grandparents and great-grandparents were connected to the soil and the cycles of nature. That felt solid and stable. We knew what season was coming next and we could understand and prepare for it. We are nostalgic for that connection. As our environment changes we are always prepared for the last environment – the last memory of the type of event we are coming to. This is why economic and planning models cease to work when the environment and technology changes. It’s why the current central banks around the world have failing models. We are always prepared to fight our last war. We move in a pattern that expands and then contracts, while we go around in a cycle. This is our seasons, the waves on the ocean, the movements of the planets around the sun. This is the ancient movement of yin/yang and male/female. We go out to conquer and back home to rest, and so then we don’t die of starvation or exhaustion. At the same time we go around in the cycles of Spring, Summer, Fall and Winter. And we learn as a species and continually develop new technologies. New expansions of our own bodies which help us to do as we like faster, more efficiently. This is why we as a globe will turn back to gold as money. Not in our day-to-day transactions (unless some short-term dystopic catastrophe hits). But in a global foundational way we will all want to back our world system in what feels most mentally solid. We as humans will see the economic road ahead crumbling and rushing towards the inevitable cliff of a failed system. It failed because technology changed. We’ll look in the rear view mirror to what we saw as worth trusting. We won’t see its problems. We’ll see with nostalgia before we develop a new plan. The humans who rule the global institutions are for the most part from the literate mechanical age. They were raised in the phonetic alphabet, and straight lined roads with production lines that broke everything and everyone into the smallest mechanical pieces to stand in a production line for efficiency. That age. The one where a person was a cog in a wheel, within a wheel that moved the beast. These children came upon a box of never-before-seen toys in a new digital age – a bottomless box of zeros-and-ones to build the monetary castles. And they did as all children do with a new set of building blocks: they erected a tower. These Central Bank Kids have played their game until now, when the tower is swaying and beginning to topple, and they can no longer hold it all up. So as it falls they will cry and we will cry. As all children do. The bigger it is the harder and faster it will fall. And they will check in the rear view mirror and see the solid gold building blocks of the past. As the world is crying they will need nostalgia to soothe the masses and prevent the sadness from turning into fighting and intense anger. They will have a short window of time to keep their leadership position before there is a chaos they cannot know the ending of. No one wants that. No one likes to lose power. They don’t want to play a game they do not know for sure they will win. New technology always brings this change. A new game of Coins and Crowns inside the old game of Coins and Crowns. And in the rear view mirror is gold. Still there. Exactly as it was. The global masses can move from one building to another in an instant now. We as tiny ants will run on our little legs to get away from the tumbling toys, and rush to what we can see as anything that was safe in our most recent past. We can move instantly from one building to another now in digital form. Geography is a place in time and space that has lost its meaning in a digital age. The digital native will catch onto this more quickly than the analog native. They will recover from the global shock more quickly if they don’t despair or turn to anger. Some astute individuals have bypassed the national towers and built their own with the same new blocks. But they didn’t build a tower. They built a chain. Bitcoin, Etherium, Ripple, Doge, Stellar – a whole new group of “nations” that can be joined and left in an instant. This is what the new technology has brought us. A chain of blocks. A many-to-many agreement of value, viewed at the same time by everyone, instead of the fiat currency debt model of the one-to-many communication age. The larger institutions, nations grouped under the IMF for example, will catch up to the smaller new “nations”. The IMF and other large ‘ships’ are turning and it has taken time. They will use digital forms of money inside what they hope will be their same system. They will use their power and their new digital money with as much force as they can to move the ants into their new buildings. And the world will look very different and new. When the powerful kids do catch up it will bring a larger change. A new global monetary system. They will/have assessed their teetering tower of fiat currency debt mode and make their own new blocks built in part or whole by what they see in their rear view mirrors. They will go back to what nations, and the rulers before there were nations, saw as money. They will go back to what was solid at the time. We will all want nostalgia while they and we figure out how the new technologies will serve us best. That’s quantum physics. A group of individual particles working as one. I’m currently in Vancouver, British Columbia. Playing music at house parties, and house parties held in the park. Writing. Reading gold history and communication theory history. Marshall McLuhan’s ‘War and Peace in the Global Village” is in hand. Back from the Gold Rush Trail where I received my latest batch of beautiful pure gold flakes and small nuggets for the ‘Wild Luxury’ collection of pure natural gold jewelry. Working hard. Hiking in the wilderness. Out on Okanagan Lake (smoke, smoke, smoke from the wildfires). On Vancouver’s Spanish Banks (more smoke, smoke, smoke). The first round of printing is at the boutique letterpress printer in Vancouver. Very exciting. Ethically sourced and fair paid gold, ethically sourced and recycled packaging that’s all handmade with care. Hand forged glass with gold straight from the rivers of the British Columbia Cariboo Gold Rush Trail. Beauty. Wealth, Radiance. Clarity. Light. Health. Honour. Compassion. Love. 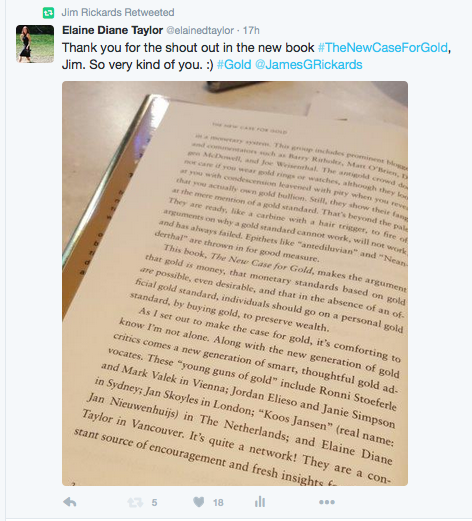 Thank you to Jim Rickards for including me in his bestselling book The New Case for Gold. I am thrilled about the peace summit and new ways of thinking about the future. No one wants to turn that wheel of peace and war.